With Steel & Silver LIVE! you can actually get inside Paul's head and know what he was thinking during the show? You are right there as Paul Gertner shares never before seen footage of his performances at a trade show, theater show, private party and yes, even a comedy club! 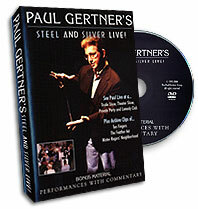 This DVD is performance only and no tricks are explained, but you will gain valuable insight from Paul's running commentary as he discusses why he selected the tricks he did, what is working well -- and what is not. Additional bonus clips include Paul's promotional tape of his one-man show Ten Fingers, his Feather Act from 1978 and his 1975 appearance on Mister Rogers' Neighborhood, which you have to see to believe!